Lightning! Or Lightening. Either word describes my transition from the PowerBook G4 to the MacBook Air. “Lightening” was my reason for heading to the Apple Store at Tysons Corner to pick up one of the first MacBook Air laptops. As for “lightning,” is it also faster than the PowerBook? Of course. You can read all the details about the Air at the Apple Web site and watch the video (if you haven't already). Writing about that would be redundant in my view, so, in case someone other than the Journal editor is interested, the following is what it means to me personally. 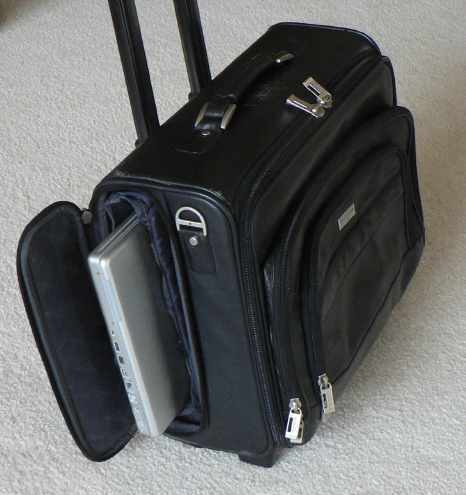 Picture #1 is my PowerBook G4 partially tucked into my old travel case as I used to prepare to leave for the office. Picture #2 is the new travel case I am replacing it with. Picture #3 is a close up of the new case. 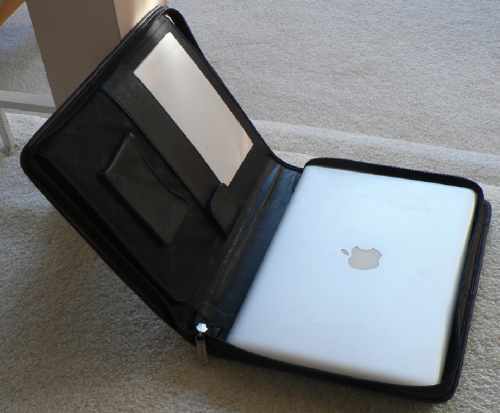 Picture #4 is a close up of the new case, with my new MacBook Air tucked snugly inside. That's right. 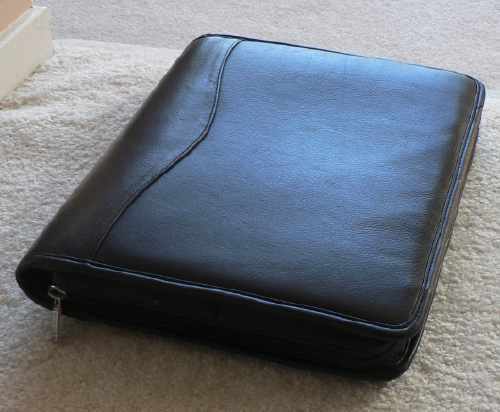 My new travel case is a simple leather 3-ring binder with the three rings removed. Gone are all the other unnecessary items that I toted along in my previous travel case. 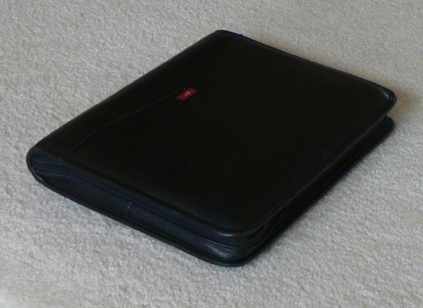 The old travel case, as you can see, was bulky, clumsy, and heavy. The new case, and the Air, on the other hand, are all I really need, all I want, and a pleasure to carry. And, of course, the Air brought along Mac OS X 10.5 Leopard and all that comes with it. It’s wonderful. What else can I say? There are a few other things. Apple’s Migration Assistant is great, but before you try it make sure your previous computer has a name. (There is a story behind that, but not necessary here. Just be sure the computer you are migrating from has a name set in System Preferences > Sharing.) Also, migration can run faster if you use an Ethernet connection rather than wireless. A few bucks buys you a USB to Ethernet adapter at Apple. How I used my two computers, desktop and laptop, may be relevant here. I always keep my live data on my laptop because it's always with me, and when I am home I access it from my desktop. I previously used FireWire with the PowerBook as a target drive. That is no longer an option with the Air but it’s just as easy to network the Air wirelessly via AirPort Base Station or Ethernet. In order to connect, when you are sitting at the desktop, assuming “sharing” is on, a simple Command-K and a couple of Return’s and everything shared on the Air is immediately in front of you on the desktop. In fact, if you have any aliases set up, just click on the alias and the network sets itself up. The Air, of course, is designed primarily for wireless operation. However, if you are still on an older network, e.g. 54 megabits per second rather than the newest 248 megabits per second, it is almost as easy to connect by Ethernet. It just takes an extra 3 or 4 seconds to plug in the Ethernet cable. There are some drawbacks, but I am not sorry I made the switch? Not even slightly. 1. I can't run System 9 and my favorite program, HyperCard, on the new machine, so I still have to maintain my PowerBook. I have tried to convert HyperCard stacks to SuperCard stacks but so far I have found it difficult. You probably won’t have a problem like that. 2. It costs over $3000. Not really. The Air doesn't have to cost that much. One sad young woman I talked to wanted to get one so badly, but thought it cost three grand and "couldn't handle the price." I explained that the $3,000 price was for the top-of-the-line version with a state-of-the-art solid-state drive and pointed out that she could buy the Air with a conventional hard drive and even more storage for only $1799. She had somehow missed that point and was delighted to know the machine was actually in her price range. 3. Depending on your point of view the Air could be a timewaster. It is a little like driving a Bugatti. People who see it keep stopping you to talk about it. If you like meeting all kinds of people and chatting about Apple, that won’t be a problem either. But again, getting back to the essence of this new laptop, its size and weight. This machine does what I want and is so handy in the hand that I never worry even slightly about dropping it. In fact, one could imagine that if dropped it would merely float gently to the ground. It is such a pleasure to carry around that all drawbacks are easily negated.